A little further up the Carquinez Straits is the Benicia-Martinez Bridge. Conveniently, most of Bay Area Toll Bridges are named after the two cities they connect. There are actually three bridges at this location. There's the brand new cast-in-place, segmentally constructed, box girder highway bridge to the left, the old steel truss railroad bridge to the right, and out of the picture frame to the right is the original highway bridge, now retrofitted and carrying southbound traffic. We'll take a look at the southbound highway bridge tomorrow. 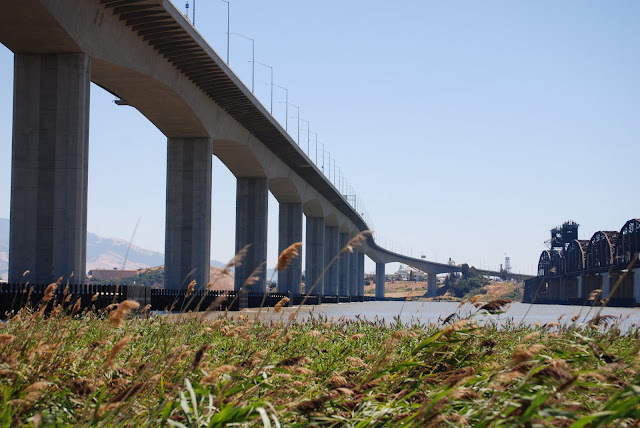 California's Bridges: Benicia-Martinez Bridges across the Carquinez Straits (1) by Mark Yashinsky is licensed under a Creative Commons Attribution-NonCommercial-NoDerivs 3.0 Unported License.